Topic Windows CE based xmlBlaster clients (C, C++, C#). The C client library supports the Windows CE environment. This setup is tested for Windows CE 4.2 (Windows Pocket PC 2003) target on a ARMV5 processor (compatible to ARMV4). and a Windows Mobile CE 5.2 target with a ARMV8 processor. To compile the xmlBlasterClientC DLL use the -DWINCE command line setting. The outcome is xmlBlasterClientC-Arm4.dll, pthreads270-Arm4.dll and zlib123-Arm4.dll. You are now ready to use any C or C++ code to link against the dll. There exists a P/Invoke wrapper around the above C dll which allows you to develop in the managed .net world. When compiled the default target chosen is Win32 .net 2.x, this works fine for example on Windows XP or Windows 2003. WINCE Windows CE To force Windows CE support, any of 'WINCE || Smartphone || PocketPC || WindowsCE' will do the same. CF1 Windows CE To have Windows CE compact framework .net 1.x support, no callbacks are available in this case. It is strongly recommended to use the compact framework 2.x, you can just install it on your PDA and it will coexist with the CF1. FORCE_NATIVEC_PLUGIN Windows (XP etc) All Windows targets use as a default the well tested PInvokeCE.cs wrapper plugin. Linux/Mono uses as a default the less tested NativeC.cs wrapper plugin. By setting this define on command line you can force the Windows Win32 target to use the NativeC plugin as well (don't try it with Windows CE, it will not work). You can as well edit XmlBlasterAccess.cs and change the plugin there. Note: The xmlBlasterClientC.dll library is assumed to be in the same directory as the executable or available over the PATH setting. You can however force any fixed path by editing PInvokeCE.cs and recompile (search for the "xmlBlasterClientC" string). There is a first - not finished - prototype of a managed C++ code. Note that managed C++ is NOT supported on CE compact framework .net, it is only supported on normal desktop .NET environments. Probably this approach is dropped again as the above C# approach covers all and can act as a gateway for other .net languages. This XmlBlasterManaged.cpp code is based on the new C++/CLI specification and is only supported in VC++ 2005 or newer. Here is an example how to setup the development environment for free on Windows, using our ant build to compile. See Visual Studio 2005 versus embedded VC++ 4. Use the zlib 1.2.3 - http://www.zlib.net/ - and compile yourself for Windows CE. Set /DZLIB_DLL (and /D_WIN32_WCE if not defined yet) and switch off pre-compiled headers (exclude gzio.c and example.c). To switch zlib on during xmlBlasterClientC compilation use the compiler define XMLBLASTER_ZLIB=1. To have single threaded xmlBlaster access (to publish(), get(), but no update()) please set the compiler define XB_NO_PTHREADS=1. Like this you avoid to install pthreads. To have full multi threaded access with xmlBlaster callbacks please link against the pthreads-win32 2.7.0 library from http://sources.redhat.com/pthreads-win32/. Download the patch for Windows CE from http://www.xmlBlaster.org/wince/pthreads-2006-11-29.patch and apply it on pthreads 2.7.0 or better the cvs checkout from 2006-11-29. Here is an example how to setup the development environment for free on Linux. We provide a wrapper around our Windows CE xmlBlaster client library called xmlBlaster/src/csharp/PInvokeCE.cs. It wraps the xmlBlasterClientC-Arm4.dll (and pthreads270-Arm4.dll, zlib123-Arm4.dll). Like this any C# code can access xmlBlaster with compression support, multithreaded and with tunneled callbacks. A demo client to get you started is xmlBlaster/src/csharp/TestPInvoke.cs. You need to compile the three dlls yourself or download them at http://www.xmlblaster.org/xmlBlaster-win-dll-1.4-15829M.zip. Then create a VC++ 8.0 project for Smartphone or PocketPC or Windows Mobile and compile Hello.cs, TestPInvoke.cs or your own client. 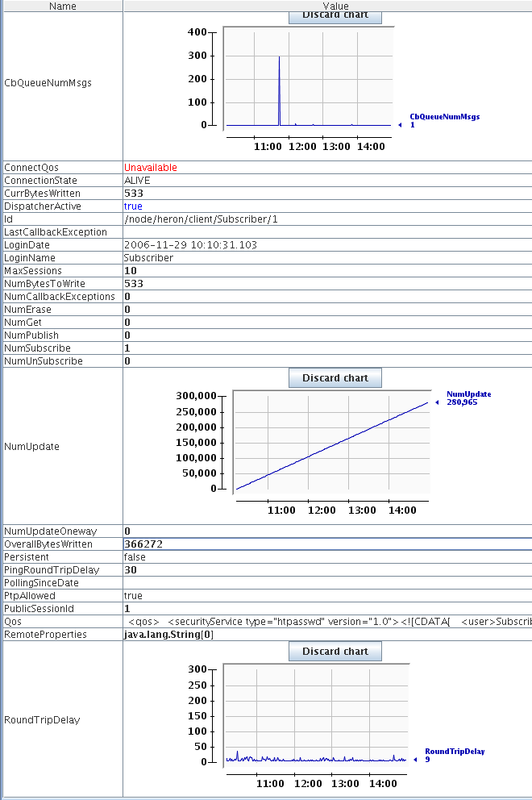 The following screenshot shows the connection properties (jconsole server side) from a Psion Workabout Pro running Windows CE 4.2 with a Intel XScale StrongARM 400 MHz processor. It is connected over WLAN to a Linux box on which the xmlBlaster server is running. 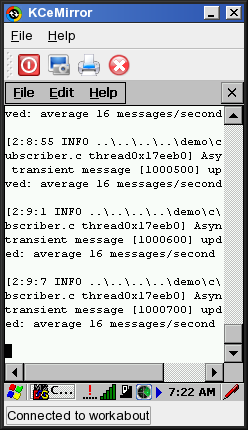 At the time of the screenshot there were almost a quarter million messages delivered with a throttled publish rate of 12 messages/sec (the publisher runs on a Linux box). The latency (sending one message and receiving a ACK for it) is ~7 milliseconds. The test finished with one million messages send to the PDA without any problems.